Choreobot now stands as the term for the ideas in this project as they materialized in the original performance. In Choreobot and everywhere on this site, VICKI was a performance name for the bot. This is not to be confused with the keeping of the name VICKI for the expansion of this project on a new site. Choreobot has been researched on 2 tracks. The first was testing Choreobot with research questions. The second was sending Choreobot to others for entirely personal use. I am indefinitely departing from researching Choreobot on either of these tracks. 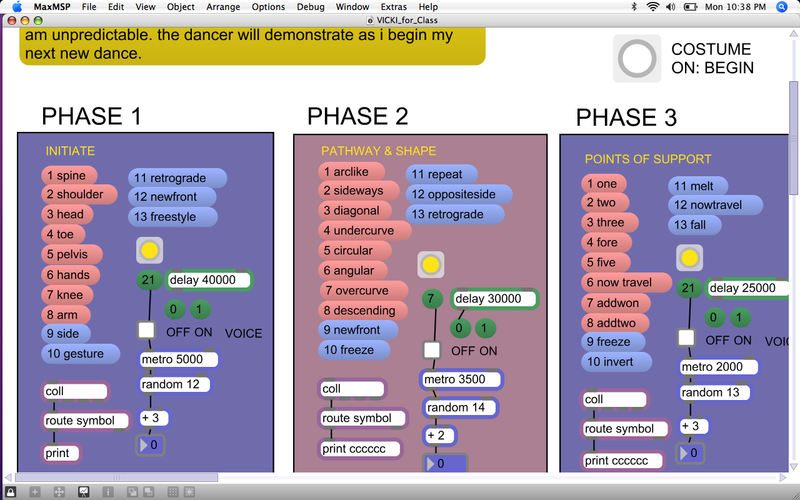 into fully formed software that can be used in dance technique. This version will be called simply VICKI. I will keep this site up and running in the meantime, but my current research is here. There are three sections to VICKI’s program. In the first section, VICKI commands the movement, and the dancer decides how to perform it. In the second section, the dancer improvises the movement, and VICKI commands how it develops, creating movement phrases. In the final section, VICKI commands the dancer to perform the phrases in a random order to match the sound, equally random in tempo variance, ending the performance in a climactic, yet comical culmination. In relating choreographic tools to automated creativity, I hope to revive intrigue in all audiences, whether familiar with dance or not, and provoke questions on dance methods by which “intelligent” choreography is modeled. *VICKI is a flexible program that may be altered. This site is the archive of the process, and is updated to include new research as it occurs.